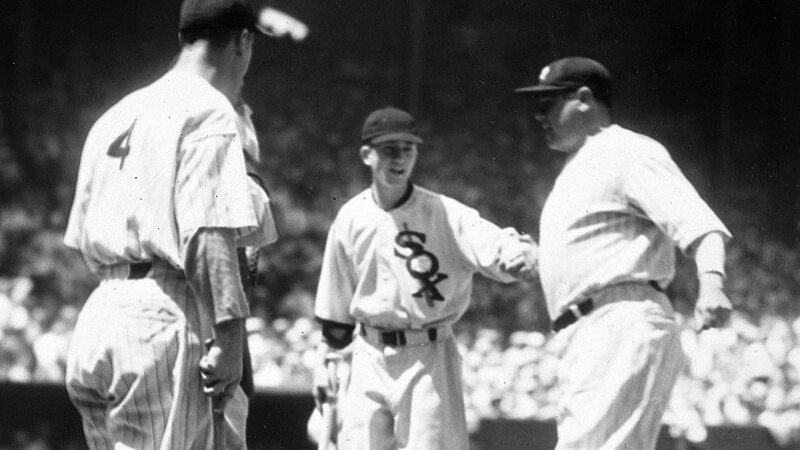 All-Star Moment: Babe Ruth's two-run shot gives AL enough to win inaugural Midsummer Classic. Babe Ruth hit the first home run in All-Star Game history and also added a spectacular catch in the first Midsummer Classic. Fellow future Hall of Famer Frankie Frisch also homered, while pitcher Lefty Gomez was the first winning pitcher in All-Star history during a 4-2 American League win at Chicago's Comiskey Park. a-Grounded out for Wilson in the 6th. b-Doubled for Bartell in the 7th. c-Flied out for Warneke in the 7th. d-Struck out for Hubbell in the 9th. HR: Frisch (1, 6th inning off Crowder, 0 on, 2 out). TB: Hafey; Terry 2; Frisch 5; Traynor 2; Klein; Warneke 3. RBI: Martin (1), Frisch (1). Runners left in scoring position, 2 out: Bartell; English 2.
a-Singled for Crowder in the 6th. HR: Ruth (1, 3rd inning off Hallahan, 1 on, 0 out). TB: Gomez; Chapman; Simmons; Cronin; Ruth 5; Averill; Dykes 2. RBI: Gomez (1), Ruth 2 (2), Averill (1). Runners left in scoring position, 2 out: Gehrig; Chapman; Dykes; Ruth; Ferrell. SB: Gehringer (1, 2nd base off Hallahan/Wilson). Hallahan pitched to 3 batters in the 3rd. Game Scores: Hallahan 36, Gomez 56. Groundouts-flyouts: Hallahan 3-2, Warneke 5-4, Hubbell 3-0, Gomez 4-1, Crowder 6-0, Grove 2-2. Batters faced: Hallahan 13, Warneke 17, Hubbell 8, Gomez 10, Crowder 12, Grove 12.